Updated 9:20 p.m. | Even though Congress has voted to reopen the government after a brief shutdown, House Democratic leaders, who didn’t sign off on the deal their Senate counterparts helped negotiate, plan to continue their push on immigration and spending issues with a key leverage point: the budget caps. The House on Monday evening quickly passed a stopgap funding bill that will reopen the government through Feb. 8 by a 266-150 vote, sending the bill to President Donald Trump, who signed the continuing resolution that night. The CR largely mirrors one the House passed Thursday. 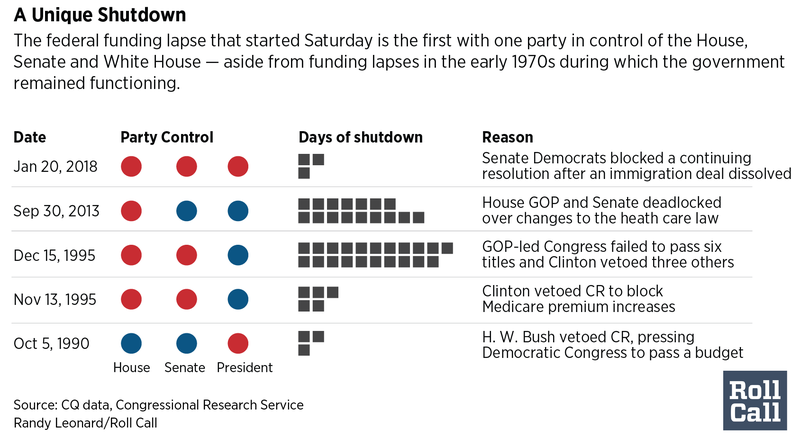 That measure stalled in the Senate, leading to a three-day partial government shutdown. The major change the Senate sent back to the House would move up the end date of the CR from Feb. 16. It retains the original language funding the Children’s Health Insurance Program for six years and delaying enactment of three health care taxes that were enacted as part of the 2010 law. Lawmakers are hoping to avoid another shutdown and plan to spend the next few weeks negotiating unresolved issues, including the sequestration spending caps, disaster aid and immigration. At least one more short-term CR will be needed before lawmakers can pass a broader omnibus spending bill for the remainder of fiscal 2018, lawmakers in both parties acknowledged. To get to the point where Congress can pass an omnibus instead of another CR (the one moved Monday is the fourth CR since September), congressional leaders first need to reach an agreement on the budget caps. The Budget Control Act of 2011 created a deficit reduction mechanism of automatic spending cuts known as the sequester. The sequestration cuts create budget caps for defense and nondefense spending that Congress cannot breach without passing new legislation. The caps for fiscal 2018 are $549 billion for defense and $516 billion for nondefense. Republicans want to increase defense spending by roughly $80 billion. Democrats support a defense boost but want equal domestic funding increases, with offsets. Any bipartisan agreement reached on the budget caps (the Senate will require Democratic votes to get past the 60-vote threshold) would represent too much spending for many House conservatives, which means House Democrats’ votes will also be needed. “While today’s vote ends the Trump Shutdown, it does not diminish our leverage,” House Minority Leader Nancy Pelosi said in a Dear Colleague letter Monday, criticizing Republicans for holding up a broader spending agreement. “Because of the Republican Majority’s weakness, we still do not have a long-term spending bill to address our defense and domestic priorities,” the California Democrat wrote. House Minority Whip Steny H. Hoyer told Democrats during a caucus meeting Monday afternoon that they have the high ground, according to a source in the room. Republicans haven’t actually funded the government because they don’t want to agree to parity in raising the spending caps for defense and nondefense spending as Congress has done for the past four years, the Maryland Democrat said. “We neither lost the battle, nor the war, and the war will continue,” Hoyer said, according to the source. Senate Majority Leader Mitch McConnell’s commitment to both parties was to continue negotiating on the budget caps and other spending issues in addition to immigration. Absent an agreement before the Feb. 8 CR expires, the Kentucky Republican promised to bring an immigration measure to the floor for open debate. A majority of Senate Democrats, including Minority Leader Charles E. Schumer, found those terms acceptable enough to get their support for the CR. But some Senate Democrats still voted against it because it didn’t resolve the immigration or spending impasses. “There are many pressing and unfinished priorities, and I cannot give my support to yet another short-term, stopgap measure that, yet again, keeps budget priorities on autopilot, without the ability to adjust for changing priorities since these budget levels were frozen a year ago,” Senate Appropriations ranking member Patrick J. Leahy of Vermont said of the budget caps. The pledge by Senate GOP leadership means nothing to most House Democrats, given that Speaker Paul D. Ryan has not promised to do the same. Ryan has committed to bringing up a hard-line immigration bill by House Judiciary Chairman Robert W. Goodlatte if House Republicans can get the votes needed to pass it. Democrats oppose that bill. Tennessee GOP Sen. Bob Corker said Democrats are giving up some leverage but not much. Corker said he doesn’t expect an omnibus spending bill to pass out of the Senate until after the DACA debate occurs, but he predicted leaders will agree on the caps so the bill can be written. A budget caps agreement before a DACA vote is unlikely given Pelosi’s continued push for a broad agreement on spending and immigration that would address four pillars: “parity” and “pay-fors” in raising the budget caps, as well as an immigration compromise that would address “border” security and the “Dreamers,” young immigrants brought illegally to the country as children. Pelosi said she personally didn’t see any reason to support the Senate agreement because it doesn’t address those four pillars. Such an agreement would need to include a vote in both chambers, she said, suggesting that will remain her position moving forward. “We’re so close to agreement. It’s almost as if they don’t want agreement,” Pelosi said of Republicans. While Pelosi and Hoyer opposed the Feb. 8 CR because of the unresolved members, they did not whip their members to vote against it. Many did so anyway. But some House Democrats found reason to vote “yes” on Monday’s stopgap measure, joining the vast majority of Republicans. “Let’s take the Republicans at their word that they’re going to negotiate,” said Illinois Rep. Cheri Bustos, co-chairwoman of the House Democratic Policy and Communications Committee. Bustos said she voted “yes” to give leadership “an opportunity for more time to get this worked out” and for lawmakers to work together on a solution. Rep. John B. Larson said that despite there being “a great deal of distrust” toward Republicans, it was fair to give them the opportunity to hold true to their word. “And then if they renege on what they promised, the whole nation knows,” the Connecticut Democrat said. The budget caps are less of a leverage point than the public’s support for the priorities Democrats are pushing, Larson said. He said the caps are leverage but haven’t produced a solution yet, given that Congress is passing its fourth CR.